“Liebestod” is the title of the final dramatic musical piece from Richard Wagner’s 1859 opera, Tristan und Isolde, but the word itself also means the theme of “love death” prevalent in art, drama, and literature. Liebestod (from the German Liebe, meaning "love," and Tod, meaning "death") defines the lovers’ consummation of their love in death or after death. Connecting la petite and la grande mort, the Liebestod represents love as an eternal force that conquers death and survives lovers’ corporeal bodies. The theme of Liebestod often involves the double suicide of lovers who cannot live without each other and who die of despair over the death of the other. In his book Love in the Western World, Denis de Rougemont notes that “a myth [of love death] is needed to express the dark and unmentionable fact that passion is linked with death, and involves the destruction of any one yielding himself up to it with all its strength” (21). Although Liebestod is one of the most enduring motives in the Western world, it is also a universal myth, found, for example, in the Japanese concept of Shinjū, the lovers’ “double suicide,” and the Hindu custom of “Sati,” a woman’s obligatory immolation at her husband’s funeral pyre. In Western culture, the theme of love death is present in ancient mythology, starting with the Greek story of Orpheus and Eurydice. 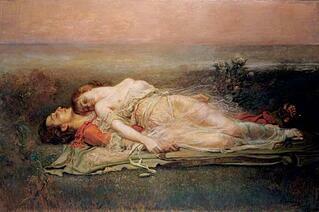 Heartbroken by the death of his beloved wife, Eurydice, Orpheus descends into the underworld to retrieve her. On their way back to the world of the living, Orpheus turns back to look at Eurydice, which he was forbidden from doing, and Eurydice disappears. In despair, Orpheus returns to the world of the living alone. Only after his own death is Orpheus’ soul returned to the underworld and thus reunited with his beloved. In Greek drama, the theme of double suicide can be found in Sophocles’ Antigone. Antigone’s fiancé, Hæmon, commits suicide upon finding her hanged body. A full audio recording of Le Vin Herbé from the Wellesz Theatre. In Roman mythology, the theme of love death appears in Ovid’s Metamorphoses, with the story of Pyramus and Thisbe, who are unable to wed due to their families’ feud. Separated by the wall between their connected houses, the lovers must whisper to each other. They manage to arrange a clandestine meeting, but upon arriving at the site of their rendezvous, Pyramus finds Thisbe’s bloody veil; heartbroken thinking she’s been killed by a lion, he kills himself by falling on his sword. Finding his dead body, Thisbe kills herself with the same sword. Shakespeare alludes to the myth of Pyramus and Thisbe in two of his plays, the comedy, A Midsummer Night’s Dream, and the tragedy, Romeo and Juliet. In Midsummer, the story is awkwardly enacted by a group of actors, called “mechanicals,” in a scene that lightheartedly mocks the exalted nature of forbidden love. In Romeo and Juliet, perhaps the best-known story with the love death motive, the myth of Pyramus and Thisbe provides a blueprint for the ill-fated lovers who both also kill themselves, each thinking the other dead. 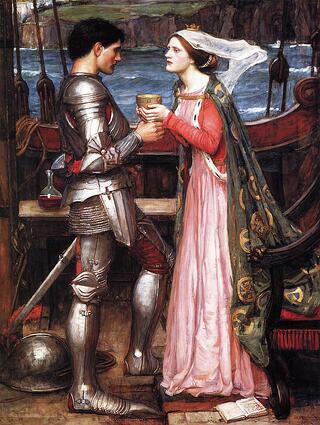 The popular medieval legend of Tristan and Iseult, about two lovers separated by fate and united only after their deaths, is one of the better known examples of Liebestod. The story reappears in many works, including Thomas Hardy’s The Famous Tragedy of the Queen of Cornwall at Tintagel in Lyonnesse, a one-act play published in 1923, and Rutland Boughton’s opera, The Queen of Cornwall (1924), based on Thomas Hardy’s play. Other famous retellings of the legend include Thomas Berger’s novel, Arthur Rex: A Legendary Novel; Rosalind Miles’ trilogy, The Queen of the Western Isle, The Maid of the White Hands, and The Lady of the Sea; and Nancy McKenzie’s book, Prince of Dreams: A Tale of Tristan and Essylte. The myth is also referenced in James Joyce’s Finnegans Wake and in John Updike’s novel, Brazil, about the lovers Tristão and Isabel. 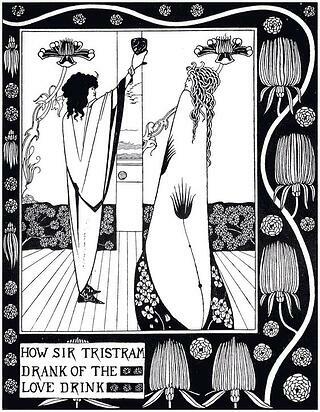 Richard Wagner’s 1865 opera, Tristan und Isolde is perhaps the most famous retelling of the legend. Considered one of the most influential pieces of music, the opera is based on the courtly romance by the 12th-century writer Gottfried von Straßburg. In both Straßburg's and Wagner’s versions, Tristan is a doomed romantic lover, idealistic and sensitive, and Isolde is a quintessential female of the 19th century, who redeems him. Wagner’s opera inspired a number of other musical works, including Olivier Messiaen’s Turangalila Symphony (1949) and Hans Werner Henze’s Tristan (1975). Frank Martin’s chamber opera, Le Vin Herbé (The Love Potion), written between 1938 and 1940, is also influenced by Wagner’s version of the legend, although Martin’s version is based on Joseph Bédier’s 1900 text of the Tristan and Iseult story. The 19th-century theme of love death found its expression in vampire tales which survived into the 20th century, particularly in the early Hollywood cinema. In the 20th century, a number of writers and dramatists, including Jean Cocteau, Jean Anouilh, Tennessee Williams and Georges Bataille, explored the theme of love death in their plays and novels. The lovers’ double death appears in movies like The Eternal Return (1943), Elvira Madigan (1967), and Pedro Almodóvar’s spoof of organismic love death, Matador (1986). Today, the theme of Liebestod can be found in vampire love stories and in some of the biggest blockbuster romance movies such as Bonnie and Clyde, Like Water for Chocolate, Forrest Gump, Titanic, and Brokeback Mountain. Binion, R. Love Beyond Death: The Anatomy of Myth in the Arts. New York: New York University Press, 1993. Kramer, L. After the Lovedeath: Sexual Violence and the Making of Culture. Berkeley: University of California Press,1997. Legman, G. Love and Death. New York: Breaking Point, 1949. Rougemont, D. Love in the Western World, Princeton, NJ. : Princeton University Press, 1983. Stilling, R. Love and Death in Renaissance Tragedy. Baton Rouge: Louisiana State University Press, 1976.